Showing results for tags 'l3'. The lumbar spine represents the mid-lower segment of the vertebral column and is composed of five adjacent vertebrae. They are convex anteriorly to form a lumbar lordosis. The lumbar spine facet joints allows limited movements and rotation. Each lumbar vertebra is formed of: A body: which is kidney shaped and is convex anteriorly while flattened posteriorly, pedicles and lamina, transverse processes, articular processes and a spinous process. This model shows the whole vertebral body with related articulations of the lower level vertebra. This 3D model was created from the file STS_036. 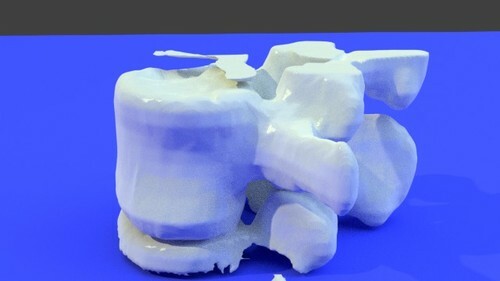 A 3D printable STL file model created from this scan can be found here.